We’d love your help. Let us know what’s wrong with this preview of The Side Door by Jan Donley. On her first day of high school, fifteen-year-old Melrose Bird, a.k.a. 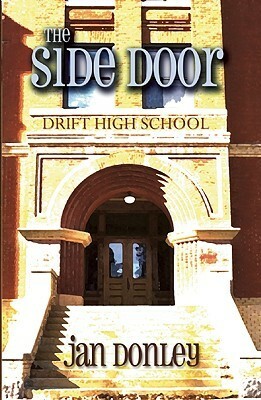 Mel, sees a woman on a park bench staring at Drift High School where her teenage son, Alex Weber, died five years ago. Alex Weber's death has never been discussed in the town or at the school. But Mel and her best friend Frank become obsessed with Alex's grave and consumed by the why of his suicide. When Mel happens upon a pair of Alex's cargo pants, she takes them. And what she finds inside the pockets brings into focus the story of Alex's brief life and his death. Determined to pressure the school and the town into recognizing why Alex died, Mel embarks on a journey and confronts a world of adult secrecy and deception. Mel also contends with a peer group who greet Mel's assertion of her identityher buzz cut and the pants she wearsby scrawling DYKE across her locker. To ask other readers questions about The Side Door, please sign up. I went through all sort of emotions reading this book. 20 years ago I might have had a different opinion and reaction towards someone close to me coming out as gay, lesbian or bisexual or transgender. These days I have a different vision and a different opinion about it. I see people who are desperate to be authentic in a world where being authentic is frown upon. They are courageous, beautiful and just like any of us don't want to feel alone. Secrets are dangerous and like one of the characters I went through all sort of emotions reading this book. 20 years ago I might have had a different opinion and reaction towards someone close to me coming out as gay, lesbian or bisexual or transgender. These days I have a different vision and a different opinion about it. I see people who are desperate to be authentic in a world where being authentic is frown upon. They are courageous, beautiful and just like any of us don't want to feel alone. Secrets are dangerous and like one of the characters often fatal. We do not have to understand, nor approve; we might try to make sense of it, at the end it might not make sense at all but we don't need to put the energy on those subjects, instead why not divert all that energy into acceptance, love, empathy and respect. I read this aloud to Witt Salley when he was in a coma, and when I finished, I was at Thai Spice, across from the hospital, waiting for my friends to join me. Tears were pooling in my eyes, and JF came in, sat down, saw me crying and (naturally) assumed I was upset about Witt. I was, really, but I was also upset about this novel. It's a great story of putting together the pieces of a mystery while dealing with the constant reminder that being who we are is such a challenge when it isn't who ever I read this aloud to Witt Salley when he was in a coma, and when I finished, I was at Thai Spice, across from the hospital, waiting for my friends to join me. Tears were pooling in my eyes, and JF came in, sat down, saw me crying and (naturally) assumed I was upset about Witt. I was, really, but I was also upset about this novel. It's a great story of putting together the pieces of a mystery while dealing with the constant reminder that being who we are is such a challenge when it isn't who everyone else thinks we should be. A bonus about this book is that Jan (and I can call her that because I know her!) weaves an effective story with words and beautiful sketches.